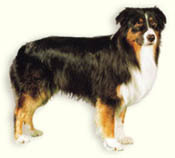 (Australian Shepherds come in different colors). 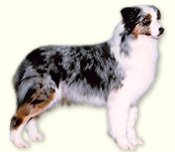 Blue Merle with white/tan (copper) markings. Red (liver) Merle with white/tan (copper) markings. 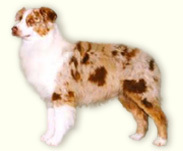 The recognized colors are blue merle, red (liver) merle, solid black and solid red (liver), all with or without white markings and/or tan (copper) points with no order of preference. The blue merle and black have black pigmentation on nose, lips, and eyerims; the red (liver) merle and red (liver) have liver pigmentation on nose, lips and eyerims. 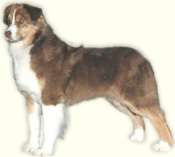 An "Aussie" can be born with a natural short tail. It has a gene for a short tail, which means that the tails can have different lengths. In a dog show it's the same if the tail is short or long. The short tail has it's advantages, when the dog goes under a fence and burr sits in it's coat. Also the tail doesn't sweep the cups and ashtray off the coffeetable. When the dog is born, it can be born with different colored eyes. "Merles" can have blue eyes. They can also have "blue spots" in a brown eye. A brown and a blue eye are often seen on the same dog. Solid colored dogs can also have blue eyes or spots. The eyes can also have the color of amber, different nuance of yellow, brown, blue and green.